Hailing from Sweden in the late 80’s, Nasty Idols were the Scandinavian answer to Motley Crue, a no holds barred sleaze rock outfit that fit perfectly into the LA Sunset Strip vein. 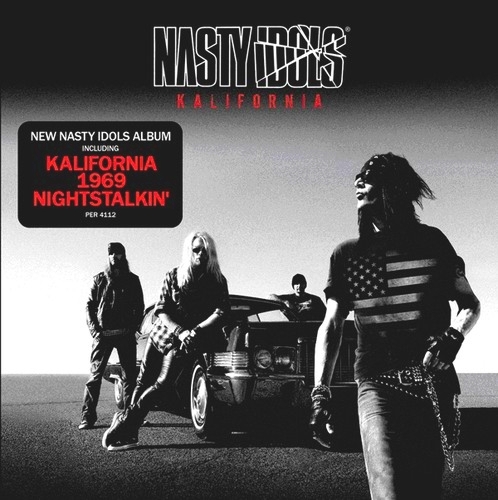 Having reformed in 2006 and releasing “Boys Town” in 2009, Nasty Idols have released their second album in 3 years – “Kalifornia”. So whats it like? The album starts of with the single “No More Rules” which is a good song, but in my opinion there are a number of better songs on the album that I would have considered releasing first if I were in charge. The songs here are pretty much in the vein of their career, which I for one am happy about. Catchy, riff laden songs like “Sister Sin”, “Kalifornia”, and “1969 (This Ain’t The Summer Of Love)” sit well next to the the heavier – and still catchy – “Pleasure And The Pain”, “Night By Night”, “Roadtrip” and “Nightstalkin'”. The album concludes with the ballad “Since U Been Gone”, which in itself is a fair song, but it does seem slightly out of place after the previous 10 high octane tracks. Vocalist Andy Pierce has a voice well suited to singing sleaze rock and he’s on top form here,managing to have his trademark raspiness while keeping it catchy, and you can hear on songs like “Pleasure and The Pain” that he is just at ease singing in a heavier style as he is singing standard sleaze rock. “Since U Been Gone” shows he can also sing a nice crowd pleasing ballad. For me the personal highlights of the album were “1969 (This Ain’t The Summer Of Love)”, “Pleasure And The Pain”. and “Sister Sin”. I think this is an album that every 80’s/90’s Motley Crue fan should own, and enjoy. To be honest,although i like the Motley Crue albums, the way Vince Neil sounds these days I’d take a gig with Andy Pierce on vocals over Vince Neil any day of the week. Verdict: 8/10. “Kalifornia” is a good sleaze rock album, perhaps a bit heavier in part than the genre standard, but I like that about “Kalifornia”.